Global Wind Organisation (GWO) approved wind turbine working at height training course for persons who are required to access and work on wind turbine generators. For access to and rescue or evacuation from wind turbines. Covers several module areas over two days. *To make a group booking or request an alternative date please contact us. GWO Approved. Provides sufficient knowledge to allow a person to work safely in wind turbines. 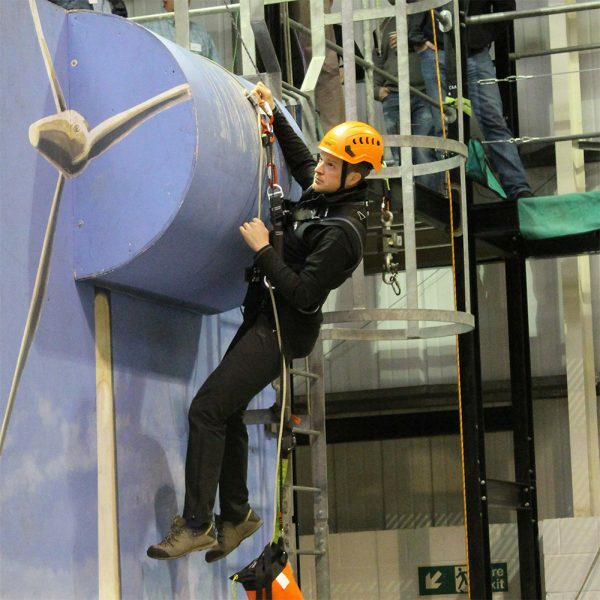 This work at height & rescue training course is for technicians who are required to access and work on wind turbine generators. The course covers several module areas over two days; including the elements of a safe system of work, equipment selection and inspection, use of tools, risk assessment, method statements and emergency procedures. Rescue practices are covered in this work at height course. Evacuation and rescue using industry standard equipment are practiced at height. For access to any area of a WTG where candidates may need to carry out installation, inspection or servicing on a variety of structures. The GWO Working at Height & Rescue Training for Wind Turbines certificate is valid for two years. After this, a revalidation of the course will be required. Please see GWO Working at Height and Rescue – Revalidation. This 1 day revalidation course is only for those who have an in date GWO certificate for Working at Heights and Rescue. Global Wind Organisation (GWO) have launched their new Global Wind Industry Training Records Database – WINDA. To enter onto any GWO course, trained individuals are now required to register as Delegates on the WINDA database. For more information please refer to our news article. 15% off equipment online for training candidates. Once you have successfully completed a heightec training course, you will be issued with your electronic certificate together with a discount code which can then be applied at the checkout when you shop on our web. View our height safety & rescue equipment. View all heightec’s GWO courses. Minimum age 18. See fitness requirements below. Must be fluent in English. Physical fitness with no contra-indications for working at height. A self-certified statement of reasonable fitness will be requested prior to attendance.